After navratri and dussehra, next big festival coming is “Diwali 2015” the festival of light. On this occasion we brings exclusive jewellery collection of pendants, bangle set, diamond rings, bracelets, earrings, diamond necklaces, mangalsutra, pendants and branded watches. 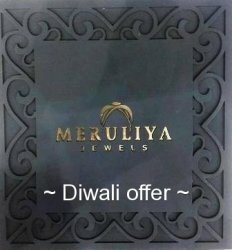 Meruliya Jewels give discount on diamond jewellery products on this diwali, to buy gold and diamond jewellery and gets gift items on each product.